“What was the qualifying cut-off marks for previous years in GATE exam ? What was the qualifying cut-off marks for GATE 2016 ? (2) Getting a job into any PSU which accept GATE score card. But for being eligible for these two, candidate first need to qualify GATE exam by securing minimum marks decided by GATE organizing Institute. Qualifying GATE exam will not assure your about getting admission into any college in India. 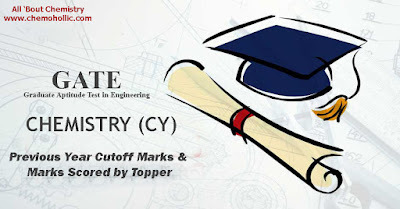 Cut-offs for getting admission into various colleges into their various programs of higher education depends upon the number of applicants & also depends upon difficulty level of GATE paper for a particular year. So there is one more cut-off which is Institute dependent, if you want to get admission into a certain college / institute then you have to secure marks equivalent or more than the cut-off marks required for getting admission into that particular college. We have prepared a list of GATE exam qualifying marks from 2011-2016 for Chemistry (CY). Using this list candidates can analyse that how much minimum marks they have to secure in order to qualify GATE 2017 exam. Thanks for this post.. I was searching all over the Internet for this.. Thanks for this awesome post. I'm regular visitor of this website.